It’s that time of the year again: E3, the Electronic Entertainment Expo, has kicked off in Los Angeles, and we’re doing daily podcasts this week to catch up on all the news, announcements, gaffes, demos, and reveals from each of the major press conferences. 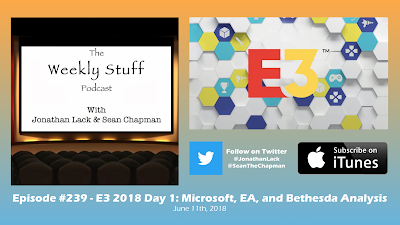 This weekend saw EA, Microsoft, and Bethesda each take their turn at bat, and they’re the focus of our Day 1 podcast. EA saw our first in-depth look at Bioware’s Anthem, Microsoft demonstrated future investment in the Xbox brand and showed off a truck full of third-party games, and Bethesda delivered a warm, funny show that effectively sold us on two seemingly unnecessary games – Rage 2 andFallout 76 – before dropping the mic several times in a row with the first official confirmation of Starfield and Elder Scrolls VI. We talk about all of that and much more in our customary depth, and will be back tomorrow to discuss Square Enix, Ubisoft, and Sony’s big shows.